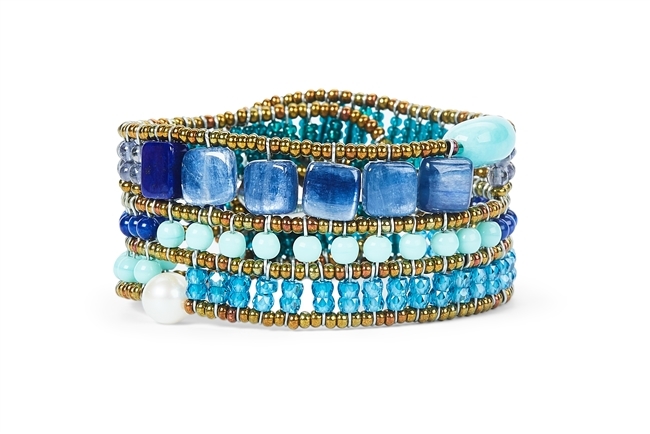 Ziio's Tabiz Bracelet in Blue Kyanite, Lapis, Turquosie & Blue Zircon Gemstones. Hand crafted in Italy on stainless steel wire. From Ziio's Tabiz Collection, this linear beaded Bracelet has all the Blue shades in the sky. Kyanite & Lapis Gemstones are accented with Blue Zircon & Turquoise. Hand crafted in Italy using Murano Glass seed beads on stainless steel wire. Sterling Silver Button Closure adjustable in length.